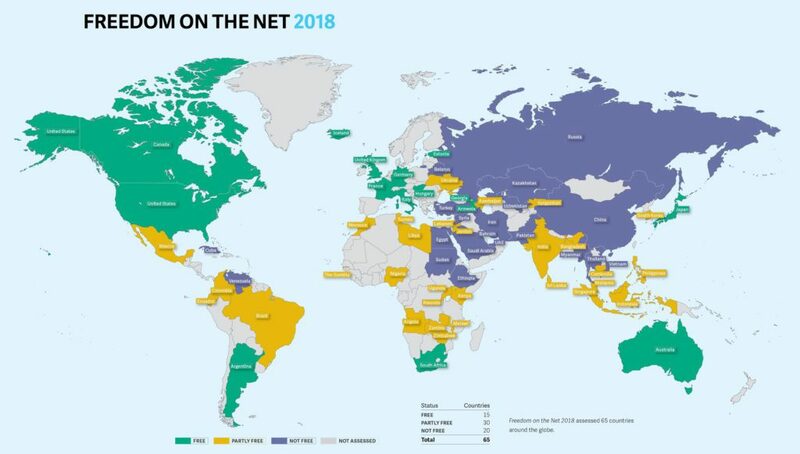 A map of Freedom House’s “Internet Freedom” rankings, Freedom House, November 2018. In collaboration with Freedom House, SMEX assessed internet freedom in Lebanon as part of the organization’s Freedom on the Net 2018 Report. Lebanon’s “Internet Freedom Score” increased from 46 in 2017 to 47 in 2018, signifying that the environment for internet freedom became slightly more repressive. The country still remains “partly free,” according to Freedom House’s rating system, but change occurred in two categories. Lebanon actually improved by a point in the “Obstacles to Access” category because the three-year internet shutdown in Arsal, a town in Northeastern Lebanon, ended in August of last year, but the “Violation of User Rights Category” decreased by two points due to the rise in arrests regarding online speech and the violent backlash that some bloggers have faced. Since the beginning of 2017, Lebanon has witnessed a spike in the number of arrests and detentions concerning online speech. Usually, the General Prosecutor compels the Internal Security Forces’ Cybercrime Unit to question individuals who have criticized prominent politicians in the country and they are often detained overnight before their trial. In some cases, the authorities demand that individuals delete the content in question or sign a pledge promising that they will not post similar content again. Additionally, there were a couple of instances where journalists who critiqued politicians faced violence. For example, journalist Ahmed al-Ayoubi, who had previously criticized foreign minister Gebran Bassil, was beaten by three men in Tripoli. Moreover, Lebanon appears to be using more advanced surveillance tools. In January 2018, the Electronic Frontier Foundation (EFF), a U.S-based organization committed to defending online rights, and Lookout, a mobile security firm, revealed that an advanced cyber-espionage campaign was operating out of a General Security building. Amongst other capabilities, the malware developed by the campaign was able to intercept calls, extract messages, record video and audio, and install applications on infected devices. “The Rise of Digital Authoritarianism” section of the Freedom on the Net Report also revealed that China held “a three-week ‘Seminar for Senior Media Staff in Arab Countries’” which “brought in representatives from Egypt, Jordan, Lebanon, Libya, Morocco, Saudi Arabia, and the United Arab Emirates.” Though Freedom House could not determine which matters were discussed at this meeting, countries like Vietnam have partaken in similar meetings and subsequently passed laws that restrict online freedom. Read the full report to learn more about the state of internet freedom in Lebanon in 2018.